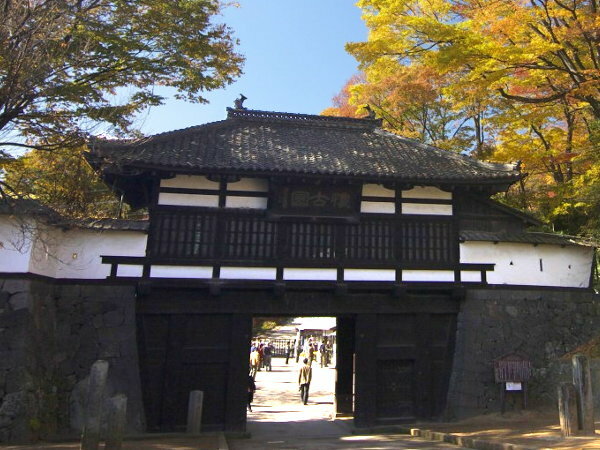 Komoro Castle is classified as a hilltop castle, and is located in Nagano Prefecture. During the pre-modern age, it found itself within the borders of Shinano Province. It is associated with the Takeda, Sengoku clans. Dates in use: 1554 - 1871. Irrashaimase! And welcome to the coziest & most historical little restaurant this side of Mt. Fuji. Thankfully, the Ote gate's days of being a destination for hungry customers are over but that is how it was used before making its way back to its original location. In its history this castle was faced with floods & been abandoned several times. In the end it has proven to be a real survivor. 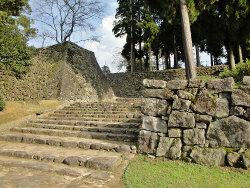 1554 The castle was built by the Takeda clan on what was said to be the ruins of an older castle built by the Oi clan. 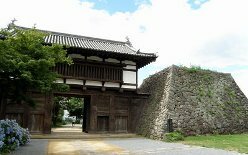 1583 The castle was taken control of by Tokugawa Ieyasu. 1590 The castle was renovated by the Sengoku Hidehisa. 1615 The Sanno Gate was built. 1622 The castle was abandoned. 1624 The Hisamatsu branch of the Matsudaira clan were transferred here to rebuild Komoro domain. 1626 The three-story main tower was destroyed by lightning. It was never rebuilt. 1647 The domain was once again abandoned. 1648 Aoyama Munetoshi was tasked with rebuilding the domain. 1742 A flood washed away the Sanno gate. 1765 The Sanno gate was rebuilt. 1871 The castle was finally abandoned. 2008 The Ote gate underwent relocation & repairs.